Her love for woodworking and DIY projects was part of the reason why she and her husband, Justin Ascherman, created Rustic Grain Designs. With a focus on expertly crafted, rustic-influenced designs, Fallon and Justin have created a new venture that is enriching the woodworking market in Tampa Bay, Florida. Fallon and Justin didn’t want to pinhole themselves into the typical pallet wood furniture limitations that a lot of rustic design companies prescribe to. They can cater to their clients’ needs, especially when it comes to designing and finishing custom pieces, including a recent piece that will be featured in a Tampa Bay showroom. When they first established their business, Fallon said she would happy to do the finish of each product, as long as Justin did the construction. She began with paintbrushes and sponges, but soon after, Justin bought a Fuji Spray system to facilitate the finishing process. 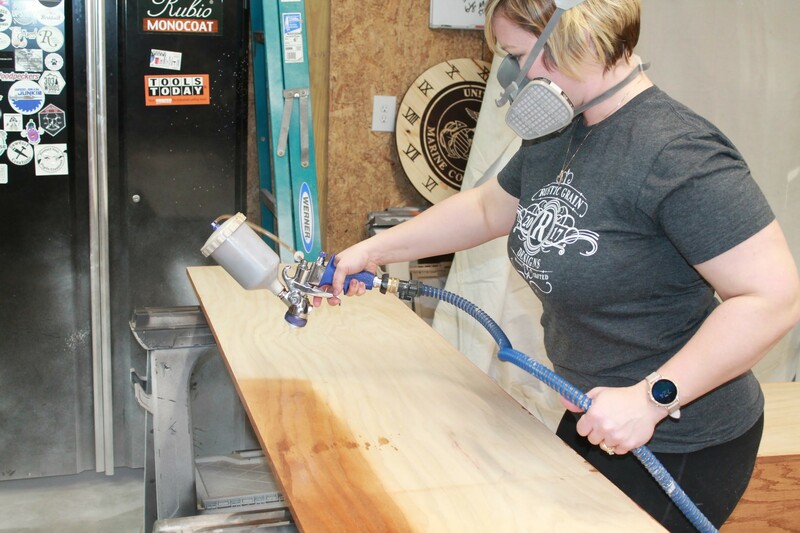 With women like Fallon at the helm, we look forward to seeing more and more women become a part of the woodworking industry, offering their unique perspectives and creating pieces that can only be described as true works of art. For high quality, efficient spray systems and finishing solutions, contact Fuji Spray today. We’re always available to help you attain your woodworking goals!